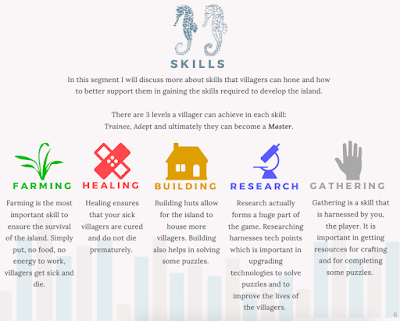 Learn how to make the best out of each of the 5 skills in the game - be it farming, building, researching, healing, or gathering, each skill has it's own importance in the sustenance of the village. I will talk about how to improve each of them in their varying methods. Learn more about the tech centre - The tech centre has always been something that people have been curious about yet there has been little information on it. I will discuss about what each tech upgrade gives to the village and what puzzles you can solve with the upgrades. 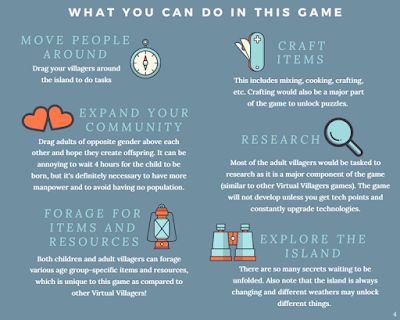 Learn how to survive, harness techpoints and craft items - I will go through the most fundamental questions like exactly how much do you gain from each coconut, how many farmers should you have in a village, the crafting formulas and time taken, etc. This book is an honest and intimate sharing meticulously written just for you. This is my favourite page in the book, which obviously you can see why the preview page and this looks so similar. This is the general guideline on things that you could do in the game. In the eBook, I will also talk more about the controls of the game and how to use various components of the game to your advantage. This is the general page for skills. 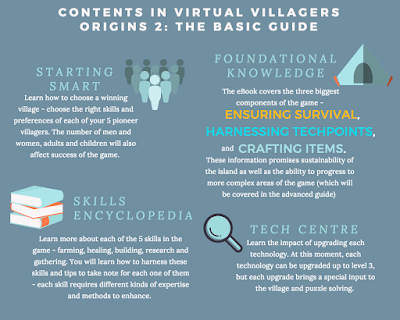 Learn how to utilize all 5 skills to benefit your village in the most efficient manner. 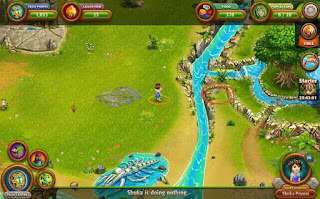 Farming - crops that each level of farming technology reveals, limitations of coconuts and crops, growth time for limited food sources, other food sources, number of farmers required to sustain a village, etc. Healing - How to train healing, creating opportunities for healing, etc. Building - Things that can be built in the game, how many builders in a village, etc. Research - Importance of research, number of researchers an island needs, tech points and its uses, etc. Gathering - Resources and where to find them, cracks, etc. And of course, everyone's most desired information, crafting formulas! 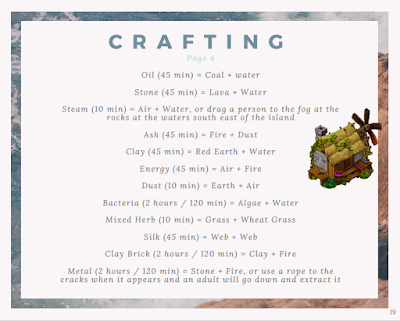 Learn how to craft certain materials as well as the time taken to craft them. Now you can better strategise what to craft before you go to bed! As you can see, the book has a whole lot of information, ensuring that you get the most knowledge out of the 26 pages (instead of those just filled with pictures). Well I hope that it won't be too wordy for readers, but if you spend money to get information, it better be worth it! Now, if you would like to buy the book, I'm currently selling it for $4.99.